The Flash Liquidizer Ultra Dousing Device, abbreviated and better known as F.L.U.D.D. 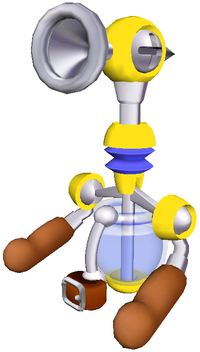 or FLUDD (pronounced "flood"), is a multipurpose water pack from Super Mario Sunshine invented by Professor Elvin Gadd. It features a water tank, two handles, and four interchangeable nozzles. It is possible that F.L.U.D.D. is Mario's equivalent of the Poltergust 3000 used by Luigi. In Super Mario Sunshine only, F.L.U.D.D. is also shown to have an artificial intelligence and is able to communicate with Mario and any other characters by speaking through the nozzle. F.L.U.D.D. 's name is a play on the word "flood", meaning a large mass of water that often causes chaos in a public area. F.L.U.D.D. introduces itself to Mario on the Delfino Airstrip at the beginning of Super Mario Sunshine. In Super Mario Sunshine, F.L.U.D.D. can be used by Mario to spray water at objects or enemies by pressing . By doing this, Mario is able to perform a multitude of tasks, ranging from enhancing his acrobatics to cleaning graffiti off of various surfaces. F.L.U.D.D. can switch between the Squirt Nozzle and either the Hover, Rocket, or Turbo Nozzle (depending on which one Mario currently has equipped) with . As the player continues to spray water with F.L.U.D.D., the amount of water in its tank will gradually get lower. When its tank is completely empty, the player must enter a body of water and hold the button, or collect a Water Bottle before any water can be sprayed again. Throughout the game, F.L.U.D.D. will also often give the player advice on how best to complete a certain task or challenge via a HUD message, which varies depending on the situation. Mario first encounters F.L.U.D.D. on the ground of the Delfino Airstrip. When he walks over to F.L.U.D.D., it introduces itself to Mario before he puts it on; the player is then shown a tutorial video detailing how to use it. From this point on, Mario carries F.L.U.D.D. around on his back and has access to it throughout the rest of the game. However, there are certain situations in the game when F.L.U.D.D. will be unavailable to the player. For example, it is taken by Shadow Mario every time Mario enters a secret level that has not been cleared at least once. 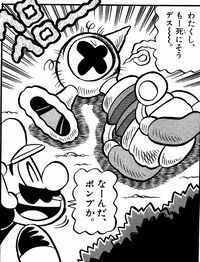 It is also taken by Shadow Mario in Episode 3 of Pianta Village, though in this case the mission involves finding a way around the fiery Goop that covers the entire village and retrieving F.L.U.D.D. Mario watches as F.L.U.D.D. shuts down near the end of the game. After Mario defeats both Bowser and Bowser Jr. in Corona Mountain at the end of the game, Mario and Princess Peach fall through the air and land on a small island on the west side of Delfino Plaza. When Mario locates F.L.U.D.D., laying on the ground a few feet from him, it is shown to be damaged and malfunctioning (presumably as a result of Mario ground pounding various weak-points on Bowser and Bowser Jr.'s hot tub, as when it reached three weak points destroyed it began to stutter), asking Mario if "[it] was of assistance" before it shuts down completely. Shortly after, at Sirena Beach, several of the Toads accompanying Mario and Peach to the island present to them F.L.U.D.D., who has been fixed. Although F.L.U.D.D. itself does not appear in Super Mario Galaxy or its sequel, Water Shooters, Fire Pressures, and Electric Pressures, all of which resemble F.L.U.D.D. 's head, appear. F.L.U.D.D. also appears in the Super Mario Sunshine arc of Super Mario-Kun. As with F.L.U.D.D. in the games, it assists Mario, although it expresses more emotion and is more difficult to be with. It sprays Mario's face, causing Mario to yell at it, for example. Several F.L.U.D.D.s appearing in Mario Power Tennis. 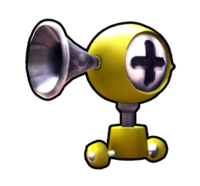 Several F.L.U.D.D.-like water pumps appear in Mario Power Tennis; these heads are used to clear away the Graffiti that can accumulate in the Delfino Plaza Court. Also, in the minigame Tic-Tac-Glow, the player must use balls of water shot by several F.L.U.D.D. pumps to clear away Goop in a tic-tac-toe like the game. They also appear in the Chain-Chomp Challenge, when a Chain Chomp begins chasing a player. Its purpose is to calm the Chain Chomp down when it's enraged. F.L.U.D.D. makes a small appearance in WarioWare: Smooth Moves in a microgame, in which it must be used to put out a building fire. The microgame later reappears in WarioWare Gold, where the F.L.U.D.D. is instead used to clean graffiti off the side of the building. F.L.U.D.D. appears as an item in Mario Kart Arcade GP 2 under its Japanese name Pump. 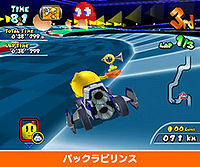 Upon being used, the item is placed on the racer's head and rotates back and forth while firing Goop at regular intervals. If a racer is struck by a shot from the Pump, they will lose speed, and their portrait will be covered in Goop for a short period of time. The Pump reappears in Mario Kart Arcade GP DX as an item. It acts as it does in Mario Kart Arcade GP 2. F.L.U.D.D. appears as Mario's new down special move in Super Smash Bros. Brawl, Super Smash Bros. for Nintendo 3DS / Wii U and Super Smash Bros. Ultimate, replacing the Mario Tornado from the previous games. When Mario uses the move, he will put F.L.U.D.D. on his back and douse his enemies with water. The attack does not damage opponents, but instead pushes them. F.L.U.D.D. charges when the move is activated and shoots water when the button is pressed again, a longer charge resulting in a more powerful stream of water. F.L.U.D.D. stops charging when it is fully charged, allowing Mario to use it at a later time. Mario can also shield or roll to stop the charging. Mario can destroy projectiles with F.L.U.D.D., and the stream of water can be angled. F.L.U.D.D also appears as a trophy in Super Smash Bros. Brawl and Super Smash Bros. for Wii U. In Super Smash Bros. for Nintendo 3DS / Wii U, the F.L.U.D.D. move has two custom variations. The first is Scalding F.L.U.D.D., which sprays a short-range stream of water that deals fire damage to opponents. The second is High-Pressure F.L.U.D.D., which sprays a more powerful stream of water and has greater range but also pushes Mario back. When spraying water, F.L.U.D.D. 's nozzle is next to Mario's head on the right-hand side, while Mario holding a handle with his left hand and holding the nozzle with a right hand. However, in Super Mario Sunshine, F.L.U.D.D. 's nozzle is above Mario's head, with Mario gripping both handles with both hands. F.L.U.D.D. also appears as a support spirit in Super Smash Bros. Ultimate. When equipped, it grants immunity to sticky floors. In Minecraft: Wii U Edition, Minecraft: Nintendo Switch Edition and Minecraft: New Nintendo 3DS Edition, F.L.U.D.D. can be found in the miscellaneous section. The empty bucket has been replaced by F.L.U.D.D. with dark blue water, the water bucket is F.L.U.D.D. with light blue water, the lava bucket is F.L.U.D.D with lava and the milk bucket has F.L.U.D.D. with milk. The water bucket F.L.U.D.D. can be used to place water, the lava bucket F.L.U.D.D. can be used to place lava, and the empty bucket F.L.U.D.D. can be used to pick up running water and lava. The milk bucket F.L.U.D.D. can be used to raise the player's health bar and is obtainable by milking a cow. Mario with F.L.U.D.D. on his back is a playable skin. Icons of the different nozzles. In Super Mario Sunshine, F.L.U.D.D. is able to use a total of four different nozzles, only two of which can be equipped at one time. Upon starting the game, the Squirt Nozzle and the Hover Nozzle are equipped by default. 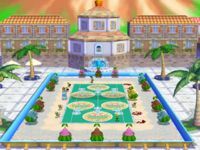 The remaining two nozzles (the Rocket Nozzle and the Turbo Nozzle) can be equipped by breaking open various Nozzle Boxes located in Delfino Plaza and its surrounding areas (although not all nozzles can be found in certain levels). When equipping either of the remaining nozzles, the Hover Nozzle is replaced by the new nozzle, as one of the equipped nozzles must always be the Squirt Nozzle; the next nozzle that is equipped replaces the previous nozzle. To change between nozzles equipped, the player must press the button. Every nozzle is controlled with . Squirt Nozzle - The basic nozzle, which allows Mario to spray water at objects or enemies. If the button is held down lightly, Mario can run while squirting in the direction he is facing. If is held all the way down, Mario stops and squirts in place while the player can use the analog stick to aim. This is the only nozzle that can also be used when in over-the-shoulder mode. This nozzle is equipped by default when starting the game or entering a level. 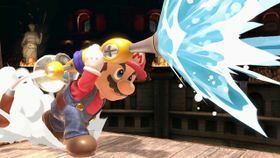 When pressing before spraying with F.L.U.D.D., Mario can spray water in large range in front of him, easier to clean large range of enemies or graffiti. It should be noticed that the large-range spraying cost large amounts of water each time. When rotating the before spraying with F.L.U.D.D., Mario can do a spin attack that sprays water in all directions near him. The spin spraying can be combined with to perform a spinning spray jump. Hover Nozzle - This nozzle allows Mario to hover in the air for about 4 seconds, with slowly increasing altitude while in effect. The Hover Nozzle is located inside blue Nozzle Boxes. Collecting a Blue Coin disables the Hover Nozzle temporarily. When Mario jumps off Yoshi, F.L.U.D.D. will automatically have a full tank of water and be equipped with the Hover Nozzle, regardless of the conditions before Mario jumps on it. Rocket Nozzle - This nozzle allows Mario to blast upwards on a stream of pressurized water after charging up for a brief period of time. He falls without hovering, though he does not take any falling damage. However, it cannot be used when Mario is in the water, so Mario has to jump from the water to perform the Rocket Nozzle in a water area. The Rocket Nozzle can be found inside red Nozzle Boxes and is unlocked after the player gets 30 Shine Sprites. Turbo Nozzle - This nozzle allows Mario to move quickly across land or water. Turning is more difficult when using this nozzle on land than using it on water. It rapidly uses up a large amount of water when used on land. It also allows Mario to break through orange and green doors, which are otherwise immovable. The Turbo Nozzle can be found inside gray Nozzle Boxes and is unlocked after the player gets 25 Shine Sprites. F.L.U.D.D. A multifunction water cannon invented by Professor Elvin Gadd that Mario totes like a backpack. Since F.L.U.D.D. is able to converse with Mario, it's believed to be equipped with some kind of artificial intelligence. With special nozzles, F.L.U.D.D. can be used like a jet pack to reach high places or for high-speed swimming. GCN Super Mario Sunshine (8/2002) When Mario straps this fine accessory to his back, he takes it to like a fish to water! He can use his F.L.U.D.D. 's high-powered water jets to blast himself high into the air or do a high-speed dash... Oh yeah, and he can defeat enemies and wash away graffiti. The built-in tutorial function makes anyone a pro F.L.U.D.D. user in just minutes! When Mario straps this fine accessory to his back, he takes to it like a fish to water! He can use F.L.U.D.D. 's high-powered water jets to blast himself way up high or do a super high-speed dash - not to mention defeat enemies and wash away graffiti. Afraid it'll be hard to use? No worries - it has a tutorial function, too! Spanish (NOA) F.L.U.D.D. Same as English name. Spanish (NOE) A.C.U.A.C. Aparato de Chorro Ultra-Atómico Combinado (Ultra-Atomic Multi-Squirt Device). The name is a pun of aqua ("water" in Latin) and «cuac» («quack» in English), the onomatopoeia of the quacking duck and the sound F.L.U.D.D. makes when trying to spray water with its tank empty. Italian SPLAC 3000 Sistema Propulsivo di Lancio Idrico Combinato (Combined Water Launch Propulsive Device) 3000. LIVV Pun on the verb лить (lit'), which means "to pour". Italian Spruzzoturbo Pun on "spruzzo" (squirt/splash) and "turbo"
Super Mario 64 in the corner. The list of titles that appears when F.L.U.D.D. scans Mario. In the game, it is displayed backwards. When F.L.U.D.D. scans Mario in Super Mario Sunshine, a little window in the bottom left corner shows short gameplay clips of various Mario games, such as Super Mario Bros., Super Mario World, and Super Mario 64. After Bowser is beaten at the end of the game and F.L.U.D.D. is looking at Mario, the window shows the Game Over screen from Mario Bros.. In addition, in the bottom right corner, the titles of several other Mario games that Mario had been in up to and including that point are shown, though they are backwards with no spaces between the words, so they normally cannot be read by the player. The game titles as they are displayed when F.L.U.D.D. scans Mario are as follows: MARIOBROS, SUPERMARIOBROS, SUPERMARIOBROS2, SUPERMARIOBROS3, SUPERMARIOWORLD, SUPERMARIOKIRT, SUPERMARIO64, MARIOKIRT64, and MARIOSUNSHINE ("KART" is misspelled "KIRT" in the game titles for Super Mario Kart and Mario Kart 64, which is likely due to a mistranslation of the kā syllable in their Japanese titles). In Super Mario Sunshine during the cutscene at Pinna Park, F.L.U.D.D. is revealed to have the Gadd Science Inc. logo at the base of its nozzle. However, this is the only time F.L.U.D.D. is shown to have it present. During development of Super Mario Sunshine, F.L.U.D.D. was planned to feature a water gun nozzle, but the idea was scrapped due to controversy in the United States at the time. This page was last edited on April 13, 2019, at 23:45.